What Are Virgin Remy Hair Extensions? "What are virgin remy hair extensions?" We don't like this term. Anyhoo, idiosyncrasies aside we'll get on to answering the question, as there is a bit of confusion as to what is meant by virgin hair extensions... so let's start at the beginning by reviewing the components that make certain hair extensions remy hair extensions. What does the term remy (remi) mean? Originally the term remy (which was originally (and still is) remis) is the past participle of the French verb remettre and means re-put or put back. It was used in relation to human hair wig making and to "put back" meant to put back the strands of hair in the same direction as they were when cut from the donor's head - all the cuticles facing the same direction; downwards. Remy hair is about cuticles and the direction in which they point. 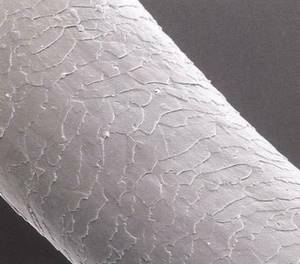 All the strands of hair have cuticles intact. All the cuticles face the same direction (downwards - away from what would originally been the root). The presence of these two features classifies hair as remis. 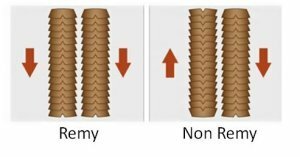 Remy hair can also be chemically processed and still considered remy as long as the processing doesn't remove the cuticles and the cuticles all point in the same direction. Remy hair can be completely unprocessed hair (also known as "raw" or "virgin" hair). Remy hair can be processed hair, which means it may have been, permed, relaxed or coloured. Ahh, so that's what virgin remy hair extensions are...! Wait... Hang On... What if the donor had processed their hair before it was cut... is the hair still considered virgin remy hair? Think about it; if the feature of hair being unprocessed is that it's unprocessed, then how can the fact that it was processed prior to being cut mean that it's considered unprocessed after it's been cut? Sure, it wasn't processed by the hair extension company but it was still processed. This actually leads nicely to another point... Well, another question really. What Aren't Virgin Remy Hair Extensions? Despite the innumerable sellers listing dyed hair as virgin, or describing textured hair (for example Afro curly hair) as virgin, the fact is the hair has been processed and so cannot be considered as virgin remy hair; it can still be remy hair, just not virgin remy hair. Any remy hair extensions that have been dyed or textured (to make curly, wavy or straight) cannot be considered as virgin anything. What Types of Hair Extensions Use Unprocessed (Virgin) Hair? All of them. Unprocessed hair can be used in weft hair extensions (hair weave) pre-glued hair extensions, micro ring hair extensions, clip on hair extensions, ponytails and other types of POP hair (put on pieces). As long as the hair extensions still have their cuticle layer, all the cuticles run in the same direction and the hasn't been dyed or texturized in any way then, then they can and if all hair strands point in the same direction then these are called virgin remy hair extensions. Righto, that's a wrap on virgin remy hair extensions.